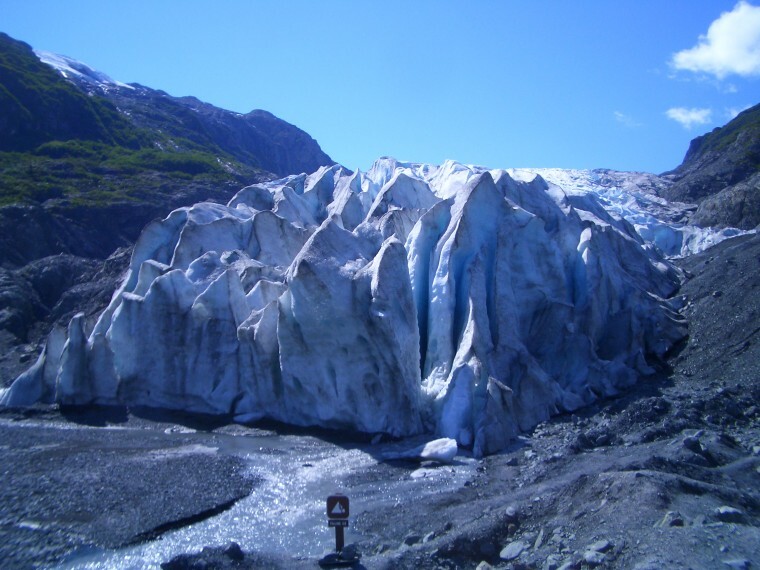 Check out Exit Glacier by heading strait before taking the turnoff to the icefield. Keep your distance, as glaciers are very dangerous. 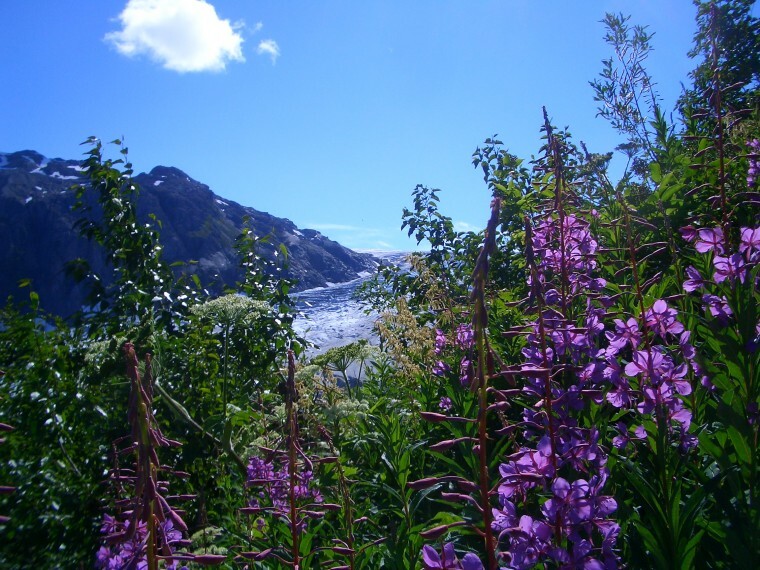 Fireweed, seen here, is plentiful around much of the first half of the trail. The dense forest begins to thin out about a third of the way to the icefield. 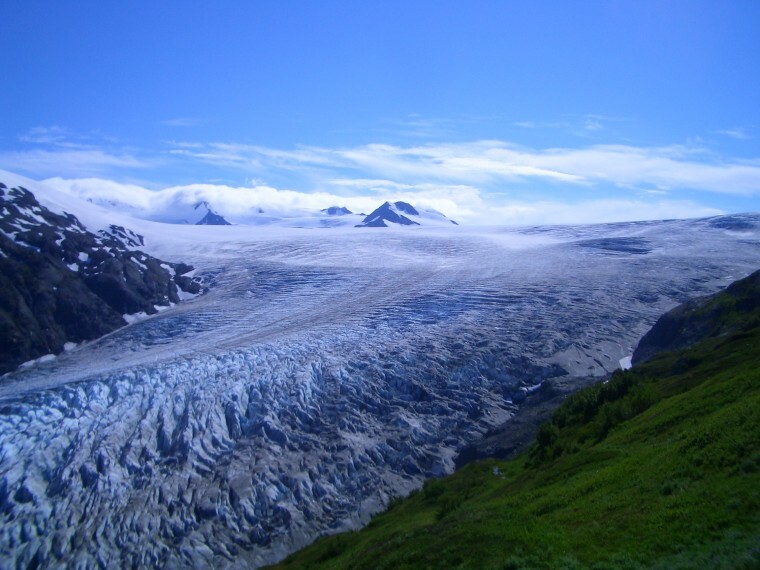 A hanging glacier can be seen in the background. Exit Glacier is visable almost the entire way up the trail. The higher up you go, the more amazing it becomes. A small emergency shelter near the trail's end. Several small orange flags mark correct routes across the patches of snow. 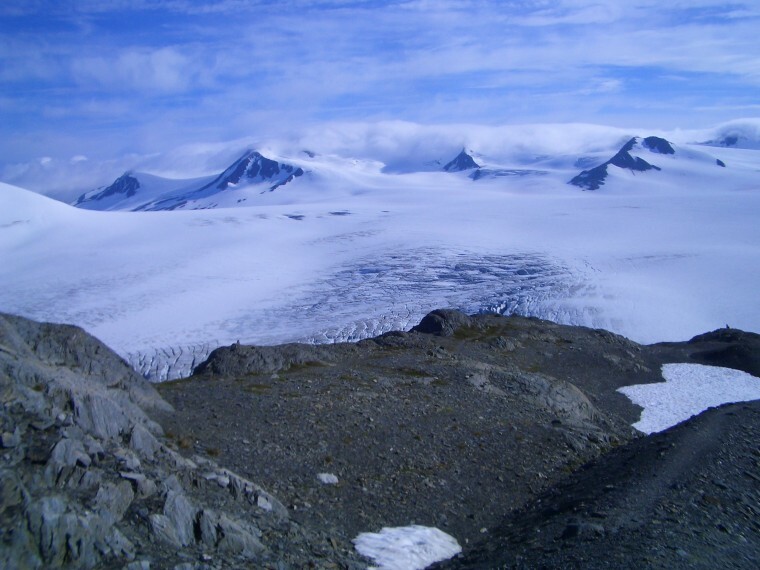 The Harding Icefield, a massive sea of ice stretching to the horizon, is the destination of this amazingly diverse trail. Starting at the trailhead to Exit Glacier, it begins in temperate rain forest, winding it's way uphill through several switchbacks. The trail follows Exit Glacier to the south while it makes it's way up and up. 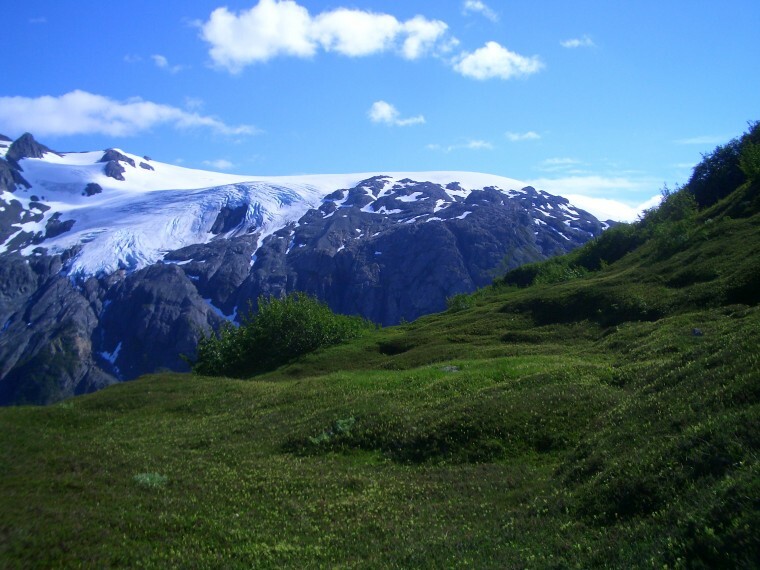 The environment gradually changes from dense forest to alpine tundra to even arctic-like conditions near the top. Keep in mind that the trail is nutorious for it's several false summits. Several patches of snow must be crossed during most of the season, yet the snow is usually matted down enough to make it easy-going. An emergency shelter is located just a few hundred feet from the final vantage point, and can be used by anyone in need. 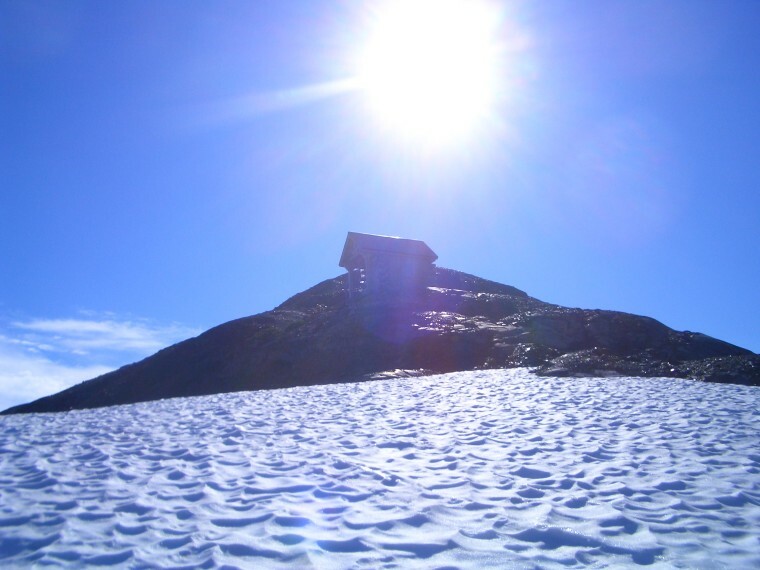 Upon reaching the top, the view of the icefield is a truly mind-blowing spectacle. Best be prepared. This trail is practically all uphill and takes some determination. This isn't the toughest trail on this site; it is well trodden and provides switchbacks the entire way, but it does maintain a rather challenging inclination nonetheless. Just keep in mind that the view from the top (and along much of the trail itself) is worth every step. From Anchorage, head south on the Seward Highway and continue for 2 and a half hours. Just north of Seward, look for a Spenard Builders Supply on your right and turn onto Exit Glacier Road. Follow this road for a few miles; eventually you should see the easy to spot Exit Glacier on your left. The road will lead past a ranger station and onto a parking lot where the trail begins. Marked signs will guide you towards the icefield trail, or just to the head of exit glacier for a 15 min walk. This trail can usually be done with ordinary clothing, however, I highly recommend bringing rain gear and a warm fleece just in case conditions get bad near the top. Also, the ranger station requires a $5.00 fee for entrance to the parking area.